Want to see more of this Katahdin cutie? 3/9/10: The Spring 2010 Lambing Season Has Begun! © Copyright 2010 FarmgirlFare.com, the first lambs always get photographed the most foodie farm blog where Joe loves that this little girl has three spots on one side but none on the other (how cute is that one over her eye?! )—not that my tough and hunky farmguy spends any time adoring baby sheep. Oh my goodness you are having the cutest lambs this year - yes she is adorable and my hunky guy gets a little mushy hearted over our baby goats too - one of the reasons we love 'em isn't it? Even though lambs are part of your business, you still take the time to pause and admire their cuteness. AH! I CAN'T STAND THE CUTENESS!!! I soooo wish we lived closer - I am trying to find someone to 'borrow' a sheep from to take easter pics - yours are the cutest ever. Ok...that picture just shows the softness! I want to pet her so badly!! CUTE!! Ohmigod, that is so adorable! What great photos- I am in love with the little lambs. Stop it! Now I want a lamb. Or two. They always stay cute and sweet smelling, right? I saw this video on youtube today and thought of you and your blog...thought i'd share it!! What an adorable little Katahdin-so sweet! Thanks for the dose of cute-people need that, don't they? I want to hug it, it is so dang cute! Your beautiful babies cheer me after a long hard day. Thanks for posting such great pictures. My personal favorites are the new little lamps and the adorable donkeys. (who knew donkeys were so cute?!) Oh yes, I really love your wonderful dogs.. and the cats too! sigh.. ok, so I can't a pick a favorite. I just love your blog - and I'm sure it's (the blog and the farm) are a lot of work. Thanks so much for sharing! 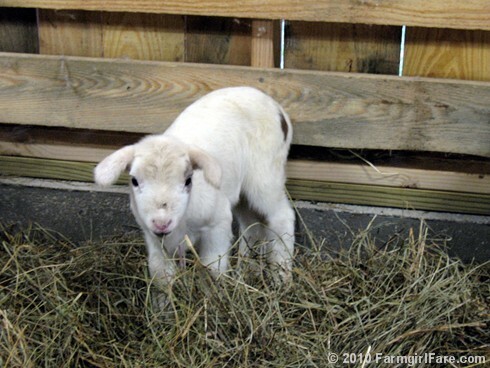 We had our first lamb born here today - I'm so excited! We mainly raise goats, I got my first sheep last fall. I am melting! 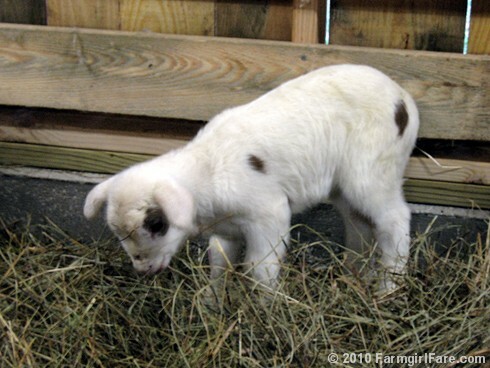 The lamb is precious!